Tate Debate: Is London’s skyline losing its edge? With a recorded history dating back to over 2,000 years ago and having survived civil war, bubonic plaque, ruinous fire and the Blitz, London is one tough concrete cookie of a city. It’s colourful past is ever-present today as the buildings that comprise the city are a veritable hotchpotch of architectural styles. Sir Christopher Wren’s 17th century churches abut glistening shopping centres and terraced Victorian houses mingle with new building developments. However with plans now in motion for a few dozen more towers to be built, for a city that has until now been able to hold onto a moderately low-rise skyline, are these plans good for London? Will London’s protected vistas and the unobstructed views of St. Paul’s Cathedral soon be a thing of the past? What will the city’s skyline look like in the future and will it still be iconic? A decade ago, plans for buildings such as the Shard and the Gherkin were widely publicised, provoked debate and were the subject of public inquiries. Now, developers and architects hold modest public exhibitions in the immediate neighbourhood of their proposals and are not overanxious that they should be more widely known about. With the adoption of candid nicknames applied to make them more palatable, here’s a short history of London’s new towers. The Swiss-Re building at 30 St Mary’s Axe known as The Gherkin received planning permission in 2000 and opened in 2004. The Shard in Southwark opened earlier this month and standing at 1,016 ft tall is western Europe’s tallest building. 20 Fenchurch Street, the Walkie-Talkie, started construction in 2008 and is due for completion in 2014. The 47-storey Leadenhall Tower aka the Cheese Grater started construction in 2008 is now too set to open in 2014. And finally, work on the 63-storey £800 million The Pinnacle, or Helter Skelter, Bishopsgate Tower has recently come to a halt with doubts over its future. As the exhibition Looking at the View opened at Tate Britain this week we’re reminded to consider the shifting landscape of Britain, both urban and rural, over the last 300 years. London’s new towers are representative of the extravagances of the past rather than the austerity of the present and as their grey cores rise like tombstones, they act as a monument to the city’s former economic prosperity. The landscapes of a nation will continue to change, there’s no stopping that, but how do we relate to and shape change? Do you think London should ‘go big or go home’ and build high like Shanghai, Dubai and New York in pursuit of the tall tower? Do you feel the landscape has changed irreparably where you live? Is London’s skyline losing its edge? Tell us what you think. It broke my heart when looking at London from the Heath for the first time in several years...I wanted John Denham and got Isaac Asimov. London should foster the sense of synchronic identity...the reunion and graceful integration of man and history...the shard is the all-too-aptly named shattering of this principle. We live in the Society of the Spectacle and shouldn't be surprised that skylines are globally expected to have a 'look at me' quality. It is a shame that London has succumbed though. The low rumble of medieval shambles. The church rising to dominate and control. Mammon rising to quash the church. Don't be surprised to see our outlook and attitudes written in the sky. Skylines are a signature of the times. The best have harmony (Sydney) and the most impressive, bravura (New York). The grow up from the life of the street below. The worst are lifeless stumps (generally rising from a lifeless desert). As the best of yet another British compromise, London is only just breaking out of its shell. But it would better to be a designed line than a random and sporadic thrusting. 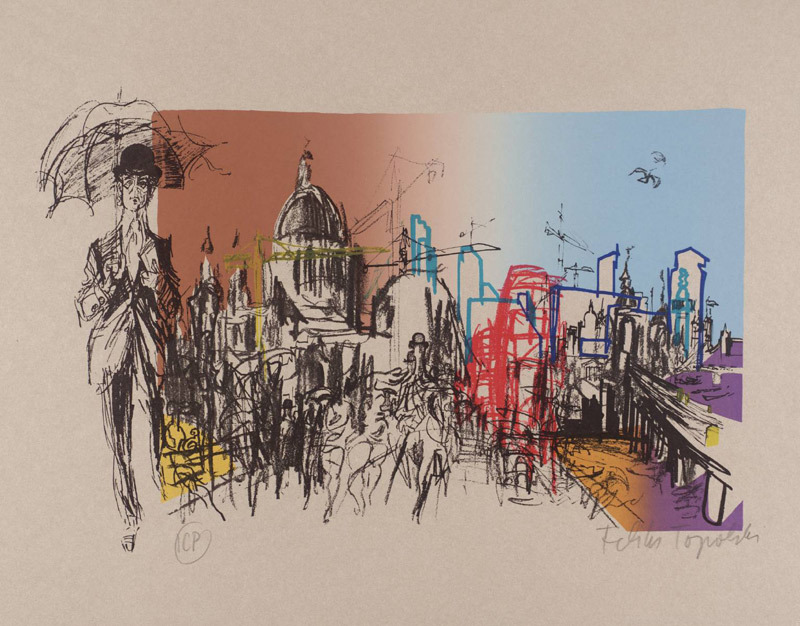 Tate Debate: How much does architecture impact on artworks? Tate Debate: Should Tower Hamlets Council be able to sell a public artwork? Artist Bob and Roberta Smith explains why he thinks Tower Hamlets council should keep Henry Moore’s public sculpture Draped Seated Woman – do you agree public art should not be sold or is there a justification for it? Blog: Tate Debate: What part do artists play in urban regeneration? Blog: Tate Debate: How will proposed changes to arts education impact on society? Blog: Tate Debate: Is selling art, selling out? Blog: Tate Debate: Do you need to know an artist’s process when looking at art?